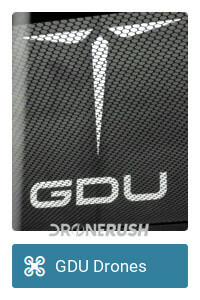 GDU has been building some of the more intriguing drones on the market today. 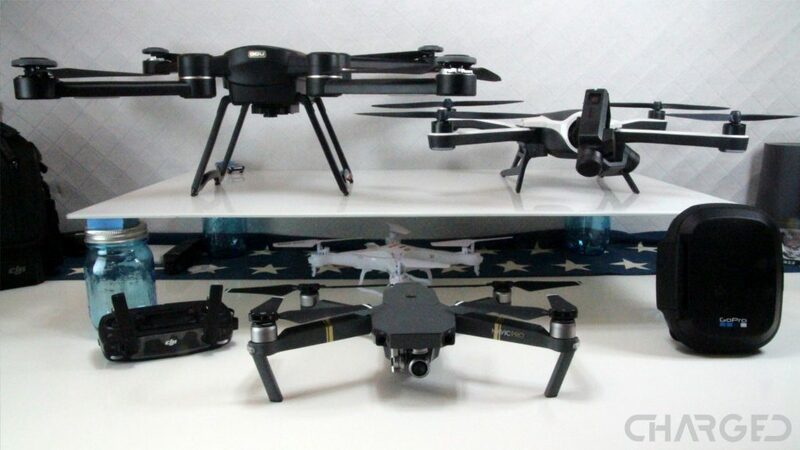 Whether folding or sliding, they like to design new techniques to improve the drone ownership experience. 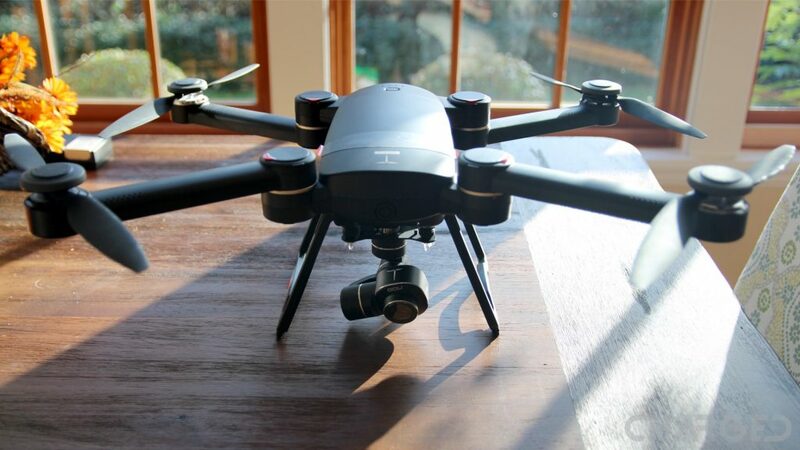 The GDU Byrd Premium 1.0 is a folding quadcopter focused on aerial photography, the Premium 1.0 version of the Byrd packs its own 4K camera and all but their latest in flight capabilities. 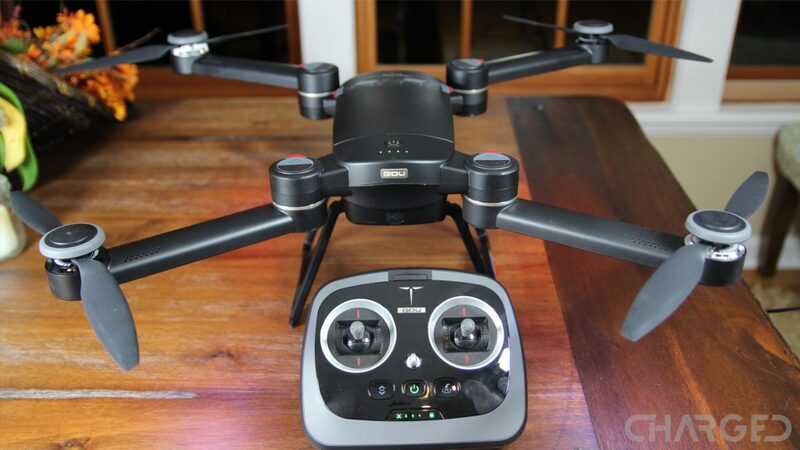 The GDU Byrd Premium 1.0 is a large, powerful quadcopter that is a blast to fly – let’s explore more in our full review. 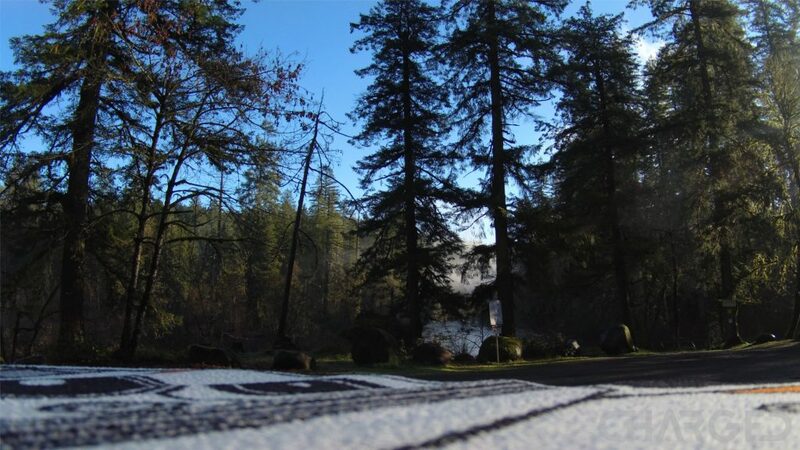 Our last flight with this drone was a great success, as far as the drone is concerned. 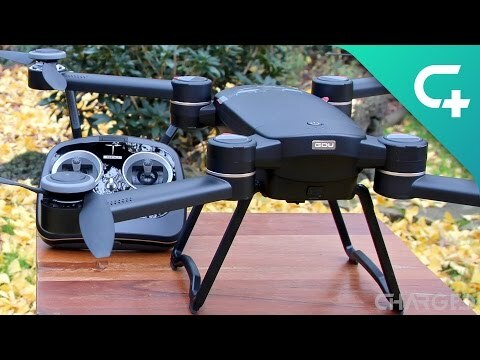 Working through the available flight modes, attempting flight with and without camera attached and utilizing some of the tips provided by GDU when we chat with them back at CES 2017 in Las Vegas, the Byrd Premium flew great. 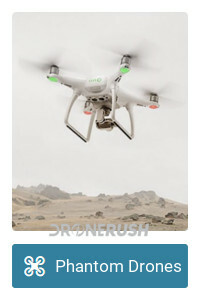 The following review expresses some concerns over this drone’s capabilities and safety, I want to tell you now that I no longer feel this way. Admitting it took some time to get used to it, the GDU Byrd Premium is a great machine to fly. It is still a powerful beast, but definitely capable and fun. The GDU Byrd Premium 2 is a vastly updated machine over the original. 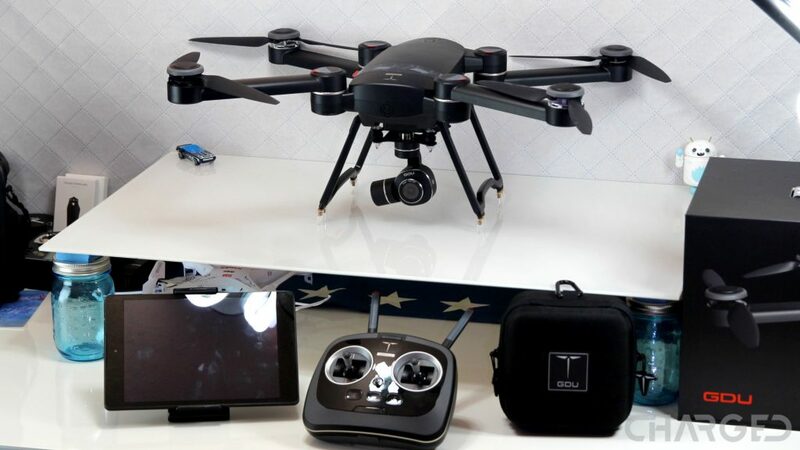 Packing superior connectivity, better flight features and the ability to accept the many camera options available, unless price prohibits it, there is no reason to purchase the old machine. Check out the GDU Byrd Premium 2.0 for $1049 on Amazon today. The first thing you’ll notice about the GDU Byrd Premium 1.0 is the size of the box it comes in. This is a well built and designed box with a convenient carrying handle and a magnetic enclosure. 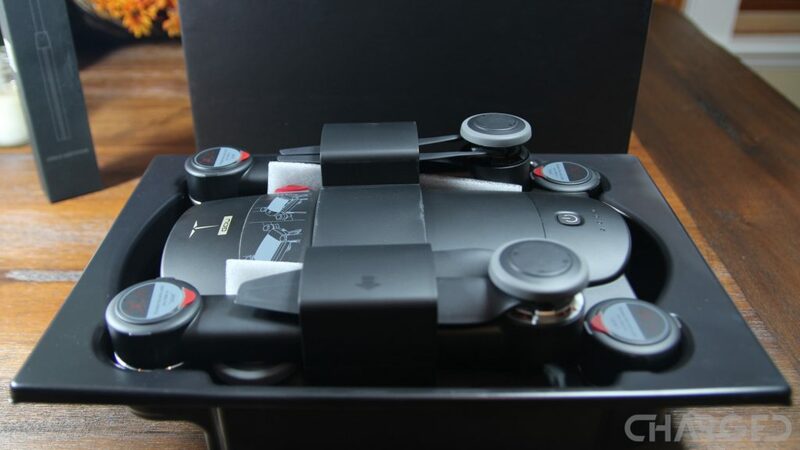 The first thing you see when you open the lid is the drone itself, packed in a tray above the controller and accessories. You get the drone, documentation, a controller lanyard, the controller, the 4K camera and mount in a protective case, the battery, a few extra propellers, a battery charger and more. I have yet to figure out the best way to transport the GDU Byrd on the daily, sometimes I pack it into the box, but other times the box feels too large and cumbersome for easy handling. No matter what, this drone requires some assembly before first flight, and for best results, some breakdown and re-assembly in between flights. 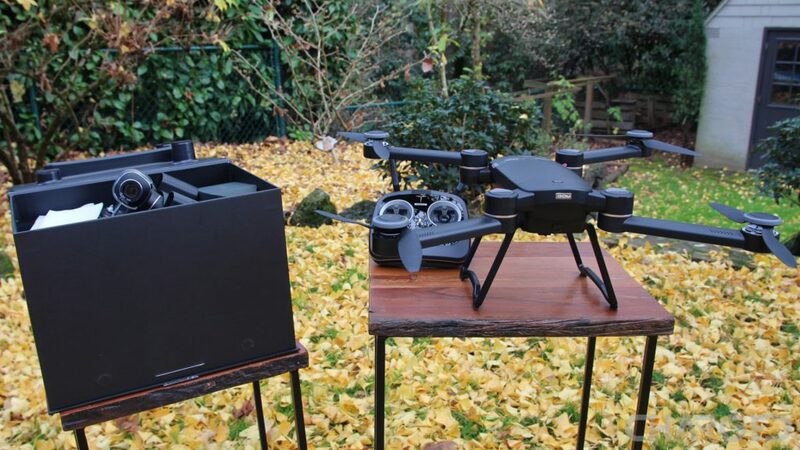 As one of the earliest collapsing drones on the market, the GDU Byrd is a fairly large quadcopter, making the folded size a little more manageable for transport. You’re looking at a mostly plastic build, with modular design to swap parts like the camera and gimbal. 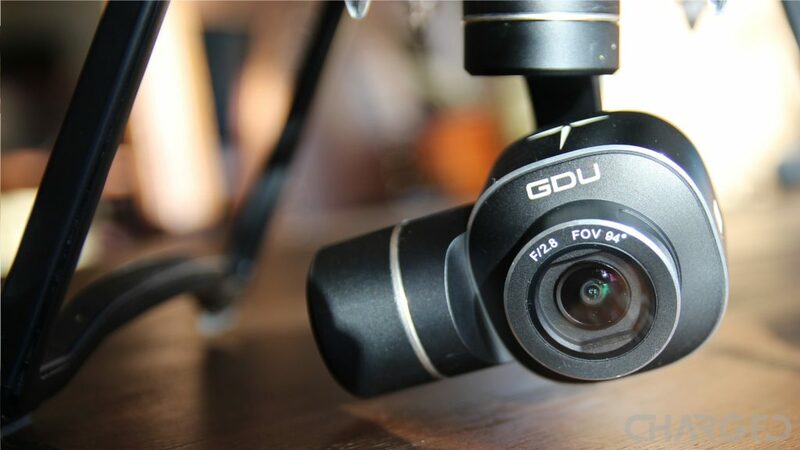 The Premium 1.0 version of the GDU Byrd is the latest available, making minor improvements throughout the unit and bumping up the resolution of the included camera to 4K recording. The camera is replaceable and easily drops away, along with the gimbal and mount, on a plate that snaps onto the bottom of the Byrd. The landing gear, or legs, cross each other when folded, and are fairly tall. They have to be to use the optional mount to attach a full DSLR camera. 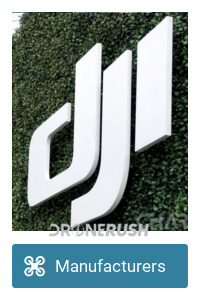 The propellers are of a folding design, like you’ve seen here already on the DJI Mavic Pro. 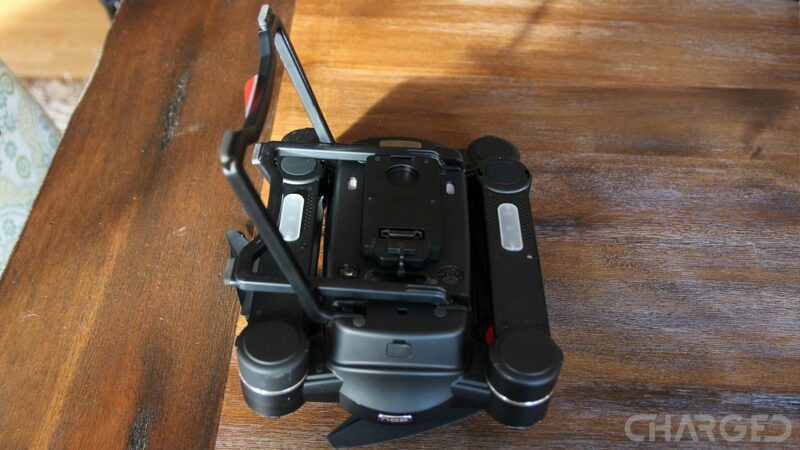 Unlike the folding DJI drone, the arms both fold in on the side of the GDU Byrd Premium 1.0. The rear arms sit lower than the fronts, meaning there is no required order for setup or take down operations. LED lights adorn the bottom edges of the arms, red up front, green in the rear. 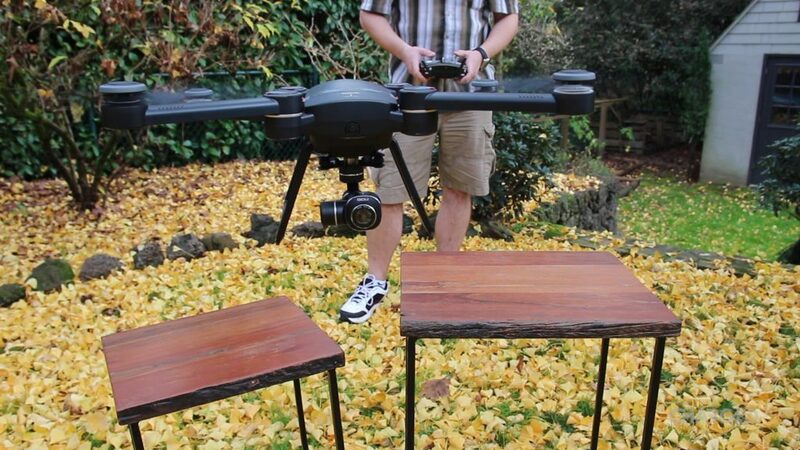 Once unfolded, this drone measures 622mm (24.49-inch) from corner to corner. Plainly put, this is the largest drone we’ve flown around here so far. At a little over 4 lbs, it also the heaviest, which means it’s the loudest and creates the most wind, nearly blowing away my improvised helipad. The top of the fuselage pops off to reveal the battery compartment, pull out the massive 6,700 mAh brick for charging, or swap in a second battery to double your existing 29 minutes of flight on a charge. Looking to the remote, all of your required flight controls live on the controller itself. There is a clever phone or tablet mount that adjusts to size, clamps onto your device and then inserts into a slot on the remote. Two adjustable antenna are on the back, as is a fold out stand. 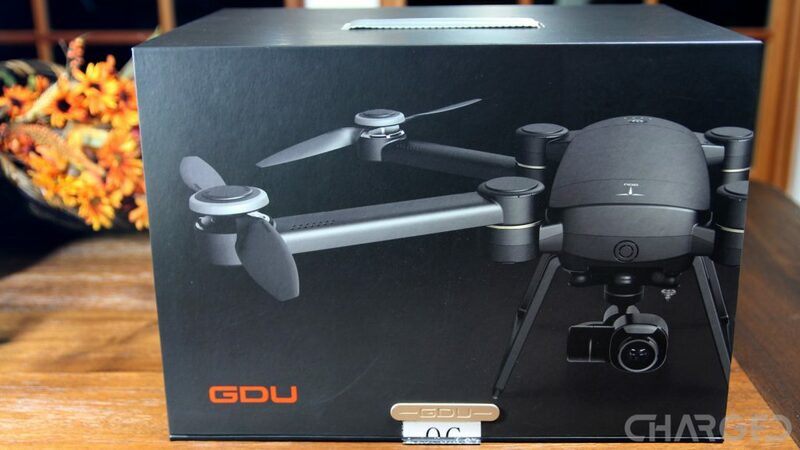 The GDU Byrd Premium 1.0 is not what I would call a precise flyer, nor a beginner’s drone. Setup and configurations is more complicated than we would have liked, so much so that you’re not going to see the mobile app through a connected smartphone or tablet. We tried several devices and just could not get things to work. 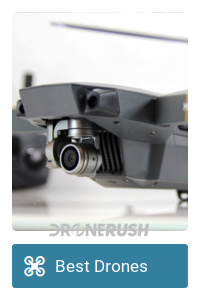 It is unfortunate that we could not get the app working on our gear, as we would have loved to see the FPV in action, and take better control of the camera for better flight footage. 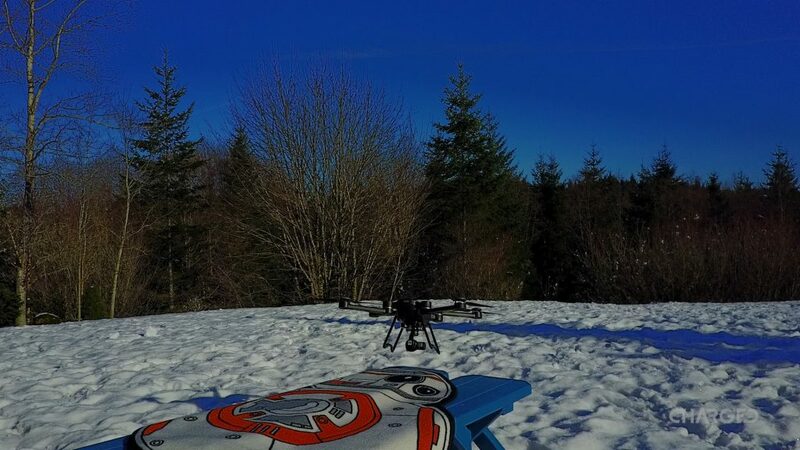 That said, this drone is so powerful that it is a little twitchy, our best aerial photography did not include dramatic expanses, but rather exciting action shots. 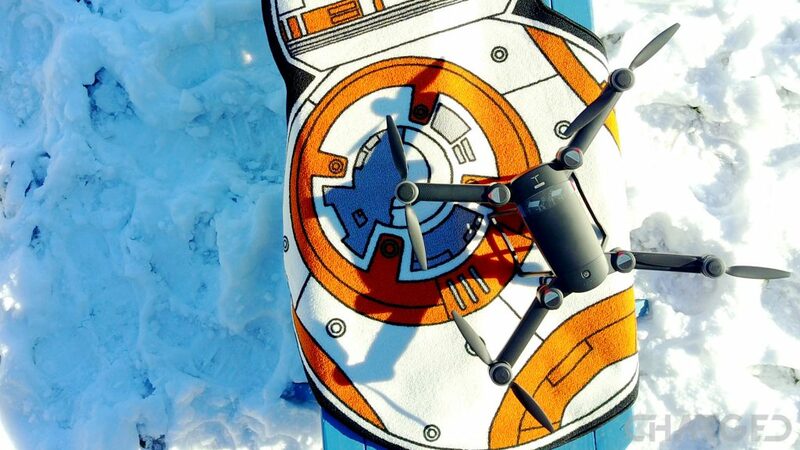 We’ll talk about flight characteristics in a moment, for now allow me to say that this is a powerful drone. It is daunting to fly at first, but once you get the hang of it, you’ll be souring around with confidence in no time. Operating the camera is a fine art on the GDU Byrd. 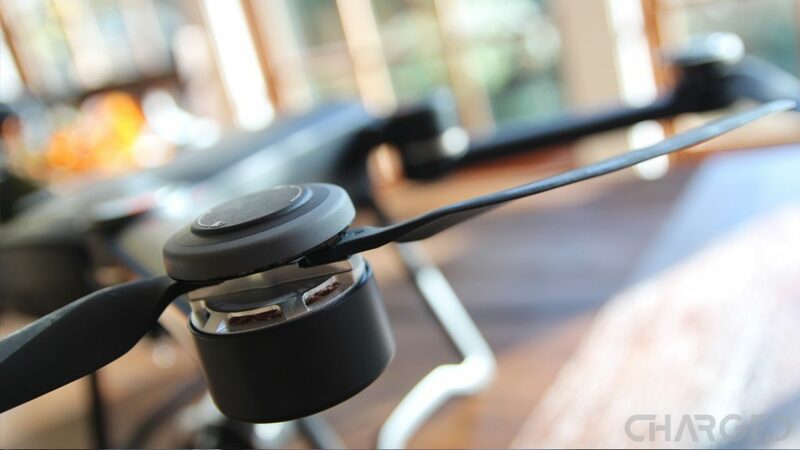 Most drones allow you to tilt the camera up and down, the Byrd Premium includes manual side to side control as well. With great capability comes more buttons and dials to control things, and we’re getting up to difficult video game level to fly the Byrd to its full potential. 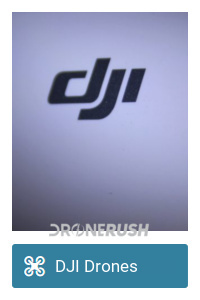 I say this as both a compliment and reminder that, as I say, this is not the drone for beginners. That camera is a 12MP shooter with 4K resolution up to 30fps. 1080p capture can be had up to 60fps, 720p up to 120fps and they’ve included 960p shooting as well. Support for up to 64GB microSD allows you to capture at least a full flight. We’ll include photo and video samples below, but I must admit I like the look of the video capture. The f/2.8 lens handles exposures nicely. We really could have gone for a recording indicator on the remote, however, as again it lives in the connected smartphone that we could not get working. The issues go deeper, unfortunately. We got the smartphone/tablet connectivity to work here in the house, as you see in the video, but we could not get it to work again when we got back outside to fly. Took the Byrd to the sky just as blind as if there were no tablet connected. Drained a battery and managed to acquire no usable footage. Don’t worry, I flew the Mavic Pro today as well, in the beautiful morning fog in the forests up to the mountain, you’ll get to see that footage in the camera review coming soon. 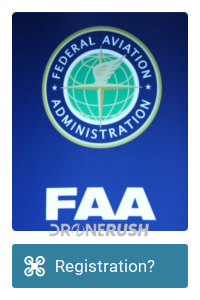 Last thing on the topic of usability – my bottom line, I am a bit afraid to fly this drone. From the very first flight, until the very last, this drone failed to respond to my controls as I would have expected them. The drone likes to do things at random that I don’t understand, like nearly crash into a tree with the completely uncontrollable return to home mode that starts itself without warning. The final thing this drone did for me that makes no sense, with the mostly-not-working GDU Pro app reporting 15% battery remaining, I was bringing it in for a landing, at about 20 feet above the ground, and unfortunately above my car, it just completely pulled a GoPro Karma, cut power and dropped from the sky. Now that I’m back at the house, I power things up and the remote tells me I still have 75% juice. This is likely, as I only flew for less than 5 minutes before the crash. That was my last flight of the GDU Byrd Premium, period. Please keep in mind, we have a pre-production model in hand, this is a review unit that is prone to a few hiccups. We will report this issue to GDU in the hopes that they address the problem, your drone purchase should not drop out of the sky. This is the same thrill you might experience when you are in a proper sports car, that exhilarating feeling that the thing is trying to kill you. 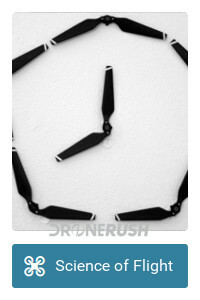 In that same vein, everything this drone does is with an oomph; this really is not a drone for new or unskilled flyers. When I say that the Byrd does not hover well, I mean only that it tends to drift around a lot. Likely this was a lack of GPS lock and calibration, but I had to constantly correct its position. Return to Home is an important mode you should expect to find on any premium drone today, and the GDU Byrd Premium 1.0 is a shining example of this feature in action. I tested RTH (Return to Home) three times, each time from further out and with increasingly difficult obstacles. Each time the Byrd navigated above obstacles and came back within a few feet of take off. One of these tests was self initiated on low battery. The GDU Byrd Premium has a built-in altitude limiter, keeping you at or under the 400 foot legal ceiling in the US. Line of sight is fairly easy to break as well, with an operational distance from controller of 2000 m (1.24 miles) in optimal conditions. Here is a quick sample of the raw video capture from the drone. (Not ‘raw’ as in the format, just straight up, non-edited footage.) Captured at 4K and compressed to 1080p. Due to the limited amount of actual footage obtained, I was less discerning about finding smooth shots; this is a twitchy drone, and so is the resulting video. Battery 6700mAh Lithium Polymer - Removable. If you are looking for a thrill ride in a drone, the GDU Byrd Premium 1.0 is an entertaining flyer. 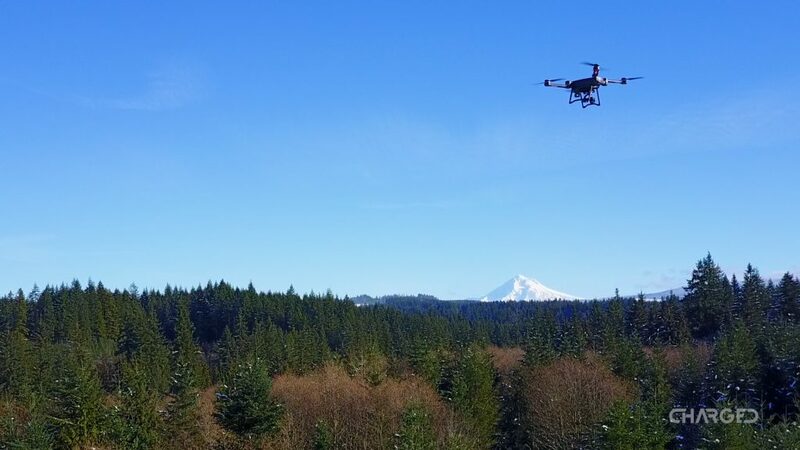 If you are looking for good quality video capture in the air, the Byrd has still got you covered, but if you are a new flyer or looking for absolutely stable video capture, the Byrd may let you down. 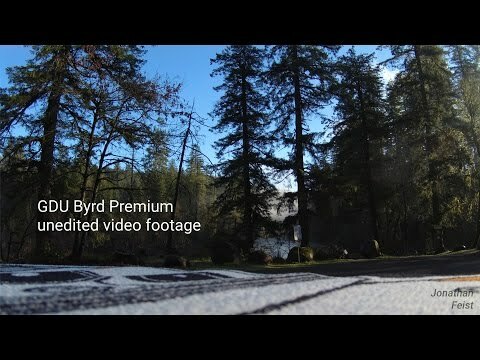 Available in three models, the GDU Byrd Standard offers a few fewer flight options and a 1080p camera for around $599, The Byrd Advanced bumps up the flight controls to that of the Premium, but includes only a GoPro mount for $749, then the GDU Byrd Premium 1.0, as you see here today, is $999.00. Our links to purchase the GDU Byrd Premium are no longer valid, instead, allow us to point you to the newer and better GDU Byrd Premium 2. It’s essentially the same craft on the outside, but with a slew of improvements on the inside. In the end, taking my entire flight experience into consideration, personally I would not purchase the first version of this drone. I respect the precautions and flight safety tools it provides, but I cannot rely on it for capturing photos or videos, and I am scared to fly it for how powerful and twitchy it is. An exhilarating experience, but the broken landing gear and dent in the roof of my car are not what I’d call acceptable drawbacks. That said, if GDU manages to fix the software issues by the time the first Byrds hit the shelves, I’ll be open to revisit it. Update: GDU revisited the issues, the Byrd Premium 2.0 is available. But you should have seen that in the review above by now. 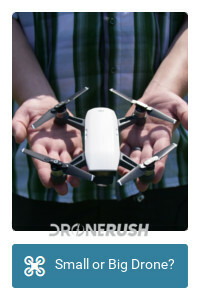 What do you think, is this beast of a drone the thrill ride you’ve been looking for?